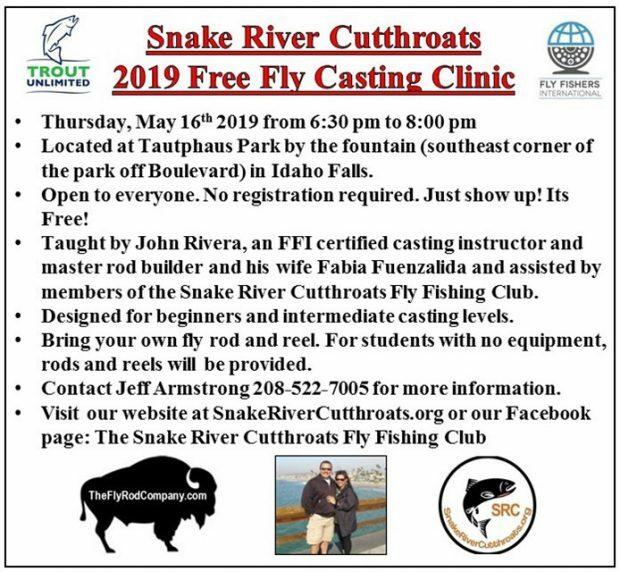 A FREE Fly Casting Clinic will be presented by the Snake River Cutthroats at Tautphaus Park near the fountain at Boulevard and Rogers streets in Idaho Falls on Thursday, May 16 from 6:30 PM until 8:00 PM. Casting instruction will be provided by club members, including John Rivera, a certified FFI casting instructor. Bring your own fly rod and reel, or if you need equipment, there will be fly rods, reels and line available for use.